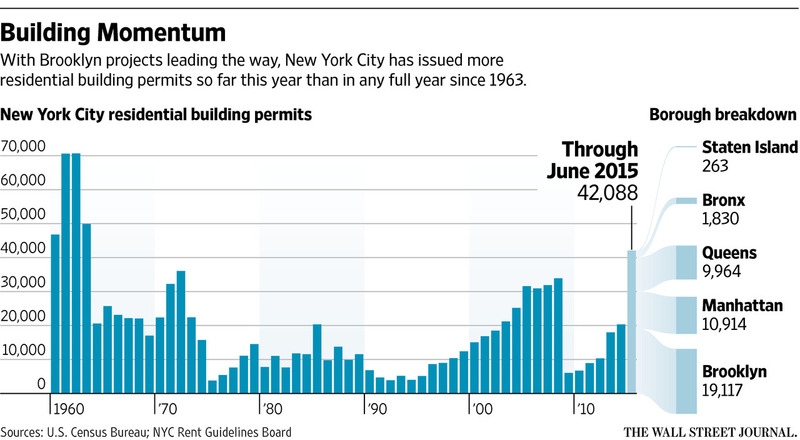 There has been an incredible surge in NYC residential building permits, the most in more than 50 years. It’s amazing to see the Brooklyn permit total nearly reach the total of remainder of the city tallied together. New York City is entering what could be the biggest building boom in a generation, census figures show, as work gets under way on hundreds of residential projects in neighborhoods across the city. In the first six months of the year, developers received new residential building permits for 42,088 apartments and houses in the city, according to the U.S. Census Bureau, already more than in any full year since 1963, when nearly 50,000 permits were issued. While permit numbers don’t translate directly to what will actually get built, it is clearly a sign of a significant pipeline in the making. UPDATE – I neglected to be more clear and say that this surge will likely collapse in the near future, since the jump in permits is likely to be wildly exaggerated as a result of the first reason above.